Don't you love this! You can build your own fairytale castle now! When I was a little girl I believed Schloss Neuschwanstein was the fairytale castle where Sisi and Franz Joseph lived. Schloss neuschwanstein I knew from my mother's jigsaw puzzle of 1500 pieces. Sisi I knew, of course, from the romantic films by Ernst Marischka that I saw on TV every year around Christmas time. The romantic image I had was unfortunately not true. The castle was not from the Emperor and Empress of Austria but build by King Ludwig II, heir to the Wittelsbach family which ruled Bavaria until 1918. He was a cousin of Sisi. And besides this, the real life of these people was not romantic at all, the films are clearly not based on the truth! King Ludwig II was a cousin of Sisi and they had a good relationship. 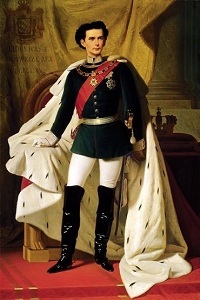 Ludwig was crowned when he was just 18 after the death of his father Maximilian II. read more. Ludwig did not care much for state affairs, and the army did not have his interest either. He let his brother lead the army and left other political issues to his governement. He was much more interested in Poetry, horseback riding and the opera. In addition, he was involved in building castles. 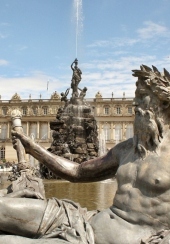 His main projects were schloss Neuschwanstein, schloss Linderhof and schloss Herrenchiemsee. One is Neuschwanstein castle whose construction began in 1869. In 1886 construction stopped after the death of Ludwig. It was almost immediately thereafter opened to the public and is in fact hardly been inhabited. The huge parade bed is only slept on a few times. In the throne room the throne still needs to be placed. Ludwig was a loner and built the castle for himself, not to throw parties or entertain guests. He was inspired by the characters from Wagner's operas. Frescoes on the walls contain many images of myths and legends that Wagner used in his opera's. Ludwig was a great admirer of Richard Wagner. They were friends and as soon as Ludwig became king in 1864 he started supporting Wagner who was in debt and had been in exile until than. The castle is quite modern. The nice thing about this castle is that you can see the kitchen that still is like when it was built. Here you can see all the modern gadgets like an automatic rotating spit for game and poultry (invented by Leonardo da Vinci). There was hot and cold running water and the heat of the stove was used to heat the plate warmer. The kitchen is only been used for 2 years. Also this was the first castle with central heating. Besides the kitchen, large heaters led hot air by a network of air ducts to the higher floors. The vast amounts of timber that were needed were transported by a lift. Another modern gadget at the time was the telephone that was available on the upper floors. A variety of styles can be seen in the palace. The bedroom is neogothic, the throne room is byzantine and in the study and the living room a romanesque style is used. 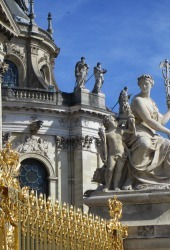 Ludwig took his inspiration and examples from other palaces and used this at random where he wanted it. The surroundings of the castle is breathtaking. You can walk up the mountain, this takes about half an hour. You can also take a carriage as Ludwig himself did, or take the bus to go up. Do not forget to buy a ticket before you start the climb, you can only buy them in the village! The best view of the castle and valley behind it you have from the Marienbrucke (Queen Mary's Bridge). 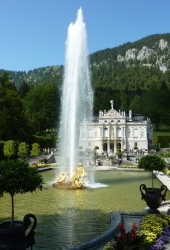 Other palaces build by Ludwig II are Linderhof castle and Herrenchiemsee new Palace. 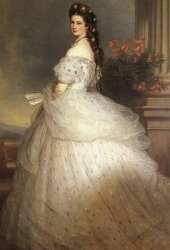 Here are some links to books regarding the Castle and King Ludwig II. I have also added the 1500 Pieces Puzzle that I made with my mother, does bring back memories! Neuschwanstein Castle can only be visited with a guided tour. Guided tours are offered in German and English. For other languages Visitors can make use of audio guide tours, which are available in Japanese, French, Spanish, Italian, Czech, Slovenian, Russian, Polish, Chinese (Mandarin), Portuguese, Hungarian, Greek and Dutch.The tour takes approximately 30 minutes. Combine your visit to Neuschwanstein Castle with Hohenschwangau Castle. You first will visit Hohenschwangau and afterwards Neuschwanstein. Visit Hohenschwangau in the morning, Neuschwanstein in the afternoon, and the museum somewhere in between or around when you find the time. For children under 18 years of age entrance is free. Don't forget to buy your ticket before you climb up the mountain, you can only buy tickets at the Ticket-Center-Hohenschwangau. You can buy tickets online too, but only one day in advance of your visit. Coach service to Neuschwanstein Castle start from the Schlosshotel Lisl ( Uphill: € 1,80, Downhill: € 1,00, Uphill and downhill: € 2,60). Please note the bus will take you to the Terminal "Marienbrücke". It is therefore unsuitable for disabled visitors since it still is a walk of 15 minutes via a steep path to the castle. The transportation to the castle by carriage or coach service can not be reserved. Neuschwanstein Castle is situated near Schwangau and Füssen in the Bavarian Alps in Germany. Click here for Eurail where you can find Train Tickets and Schedules and also Rail passes which allows you to travel across 1 to 30 countries all over Europe. Take the A7 motorway (direction Ulm-Kempten-Füssen) until the end. From Füssen first follow the road B17 to Schwangau, then the signs to Hohenschwangau. Parking will cost € 5,00 per car. Find hotels near Neuschwanstein Castle.